parkrun is a weekly, timed, 5km run. It happens every Saturday at 9am in England and Wales (and many other countries) and at 9.30am in Scotland. It’s run by volunteers and is free to enter. You register once (at parkrun.org.uk) and print out your barcode. Then turn up at a parkrun with your barcode and run, jog, or walk the 5k course. When you cross the finishing line, you receive a second barcode and someone scans both barcodes. Then, later that day, you get a txt message and email telling you your time. There are currently 784 different weekly parkruns across the world. 376 are in the UK, where parkrun began, and the rest are spread across 10 other countries around the world. It all started in 2004 with just 13 runners and four volunteers at Bushy Park in London. As the name suggests, parkruns are never on roads, or crossing roads. And it’s a run, not a race; the emphasis is on doing your personal best (whether that’s finishing in a particular time or just taking part at all). I never wanted to run. I had no interest in running. I wasn’t even that keen on exercise, except for walking into town (or, for a brief time, cycling to work sometimes). Friends kept posting annoying photos on Facebook of their parkrun achievements on a Saturday morning while I was still sleeping. Then I randomly heard an interview with Paul Sinton-Hewitt, founder of parkrun, on Radio 4 last summer. After hearing another parkrun feature on the radio around Christmas time, I found myself running three times round a cold, muddy field in Winchester with my friend, Gemma. That was the 17th January and that was my first parkrun. Two weeks later, I was staying with my runner friend, Wing, in London and we did the Greenwich parkrun. It was cold, muddy, and snowy that time. Then I did the Winchester parkrun every two weeks until I went on holiday to the US in April. Then I ran every Winchester parkrun between my US holiday in April and my Sicily holiday in June. Then my parents drove 3 hours with me from where we were staying in Sicily to stay overnight in Palermo so that I could run the new Uditore parkrun on the Saturday morning. At this point, I accepted that I was hooked. Not just on parkrun but on running in general. It turns out, I actually enjoy running. 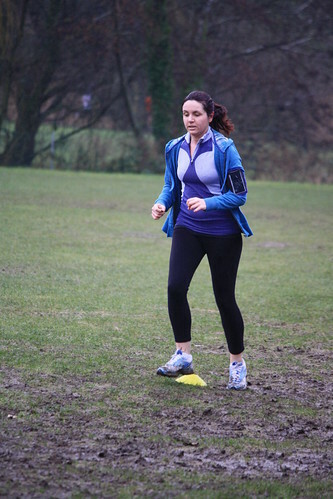 When I started parkrunning, my goal was to get to the end without stopping or walking. I had actually run 5k about half-a-dozen times a few years earlier and I knew that I could complete it without stopping as long as I went really, really slowly (basically jogging at a brisk walking pace). After my fourth parkrun, I discovered that I wasn’t quite so knackered at the finishing line and started to go a little bit faster. If you get a PB (personal best time) at a particular parkrun, that’s recorded on the website too. While I enjoyed watching my PBs coming down, I was actually more motivated by the ‘collecting’ aspect of parkrun. That was what helped me get out of bed on a Saturday morning and get down there. Every parkrun you attend is recorded. When you have done 50 parkruns, you get a free t-shirt. Then another free t-shirt at 100, 250, and even 500 parkruns (just one, very dedicated, man has that one so far). By the end of 2015, I’d done 21 parkruns and volunteered at 11 (volunteering is recorded too and has its own free t-shirt to aim for). After the first couple of times, getting up ‘early’ on a Saturday morning wasn’t so bad. My parkrunning friends, Tim and Andy, actually claim better times when a bit hungover or tired. And you can always (family permitting) go back to bed afterwards. According to Facebook, it’s not just me who often ends up napping on a Saturday afternoon after parkrun in the morning. I also love the friendly and sociable atmosphere, especially at the smaller parkruns or if you volunteer. Runners are all ages; women; men; children running alongside; children in prams; dogs on leads. By my 8th or 9th parkrun, I’d caught up with a 60-year-old regular runner and, as I got faster, an 11-year-old. I actually enjoy running. That was a surprise! Not crazy marathon distances with all the training that involves but I quite like running 5-10k distances. In particular, I love sprinting. No matter how tired I am running the distance, I can almost always find the reserves to sprint the last 100m; kind of like my main course tummy being full but still having space in my dessert course tummy. I discovered that my body can do amazing things that I didn’t believe back in January. In just 6 months, I dropped 10 minutes from my PB. I completed my first parkrun in January in 38:11 and couldn’t imagine being able to do it in under 30 mins. But I got there in July. It turns out I’m quite determined! Not only in running distances in a given time but also in finding ways to get to local parkruns whilst on holiday, even if they’re not that nearby. Running, mostly at parkrun, improved my self-confidence. The runner’s ‘high’ is definitely a thing; once I started enjoying running, I found that I usually felt great after a run, even if I was really tired. I also found running to be calming. And I’ve made new friends both at parkrun and through the (it turns out) masses of people at work who are into running. It turns out, too, that I’m a sucker for gamification. Strava is both a blessing and a curse. It’s great for the sociable aspect of running and for challenging yourself to get better times. But getting ‘kudos’ from your Strava friends and badges from Strava can be a bit too encouraging at times. That, combined with loving the social aspect and the physical wellbeing I got from running, led me to overdoing it and getting shin splints (bruised feeling in my shins). A common running rookie error of doing too much too soon. In my case, I think it was sprinting downhill on tarmac during lunchtime runs, on top of running too often and too far (in addition to parkruns) over about 3-4 weeks in the summer. The main thing is to build up gradually. I knew from the start that I could run 5k very slowly so I just gave it a go. As I got fitter, I started to get faster. By running, I could feel myself getting fitter, physically and mentally. So in June I started running more with friends, not just at parkruns. I didn’t understand that, to do a lot of running, you need to be quite fit. The muscles that you need to be strong when running (eg ankles, calves, thighs, buttocks) don’t really get stronger by running alone (or not very quickly anyway). It’s important to have strong abdominal (‘core’) muscles and glutes (buttock muscles) in order to have better posture and control over your movement. I didn’t have very strong any-of-these muscles so when I suddenly increased the amount of running I was doing, my shins got overstressed. I had been warned to build up gently but I didn’t really understand why. Moreover, I didn’t realise that any injury might not reveal itself until after I’d stopped running. I’d assumed it would hurt whilst running but, although I was tired on my last run, my shins (and knees) didn’t start hurting until later that day and over the next few days. Frustratingly, my shins still aren’t recovered enough to run any more than a gentle walk/jog yet. I now go to the gym three times a week to do both cardio exercises (like rowing machine) and weights, as well as doing some stretching exercises that the physiotherapist recommended. As a result, my knees are better (my thigh muscles are now less tight) and I’m generally stronger, fitter, and I have better balance (I can stand on one foot without wobbling loads!). But I still have some way to go. So, moral of the story: don’t go mad! Other moral of the story: cross-training (doing non-running exercise too) is important for running. I think I would probably have been okay if I’d stuck to just doing the parkruns each week as that was a nice distance each week and gave me plenty of rest time in-between. I have no expertise in any of this, of course, and have just gleaned this information from my GP, the physiotherapist, gym instructors, and online. If you want to know what the experts say and debate, go take a look online, in particular, Runners World seems pretty good at summarising the latest research and controversies. Being injured and unable to run for a while encouraged me to get involved in the volunteering side of parkrun. All parkruns are organised and run by volunteers each week. The number of volunteers required each week and the roles they take depends partly on the size of the parkrun (that is, the number of runners). The timing technology is neat and it’s all about enabling events to scale up to larger numbers of runners without getting overwhelmed. I’ve only volunteered at Winchester parkrun, which typically has between 150 and 250 runners. I’m told that the nearby Southampton parkrun, which often has around 600 runners, handles the barcode scanning etc at the finishing line with necessary military precision. I’ve now done a range of volunteer roles, including marshalling (pointing runners in the right direction on the course and cheering them on), giving out finishing tokens, time-keeping, scanning barcodes, and tailrunning (where you run last on purpose). There are other roles like photographer, run director (responsible for the run that week), and event director (responsible for that parkrun event every week). Each time you volunteer, you get another parkrun recorded on the website. After volunteering at 25 parkruns, you get a free t-shirt. To give it a go, find your nearest parkrun (look on your country’s website if you’re not in the UK). Dig out your trainers. Register on the parkrun website and print out your personal barcode. Get out of bed on Saturday morning and go along to your local parkrun. You don’t have to run if you don’t feel up to it. You can walk, even if no one else is. Don’t worry about other people’s times; you’re only competing against your own goals, whatever they are. If you really don’t feel up to it, try downloading a couch-to-5k app and doing that in your own time before you tackle a parkrun. More than anything, though, enjoy it! And don’t forget your barcode! No barcode, no time. This post is based on my OggCamp 2015 talk. The talk slides are on SlideShare.net but the speaker notes are badly presented on there so I decided to write it up properly.